Even as a 218 members strong Indian contingent left for Gold Coast, which hosts the 21st Commonwealth Games, nobody anticipated in their wildest dreams, that a large chunk of the Indian medals would come from the sport India is good, but not the best at in the world. However, proving all their detractors wrong, the Indian weightlifters had a fantastic outing, showing lots of promise, by winning a whopping 5 gold medals, 2 silver and 2 bronze medals, to end not with an all-time high of 9 medals, but also on the top of the medals table with respect to the weightlifting event. With many records broken by weightlifters such as Mirabai Chanu and Sanjita Chanu, and promising shows by Sathish Sivalingam and Ragala Venkat Rahul, the Indian weightlifting team has regained their place as a promising contingent for the upcoming Olympics, something this sport hasn't seen for the last two decades. Weightlifting at the Commonwealth Games is usually not something to cheer about. However, with supremely astonishing performances, the weightlifters have ensured that in the run-up to Tokyo Olympics, we can see some very brilliant performances that could land us surprise medals at the mega multi-sporting event to be held at Tokyo in 2020. One such weightlifter is Ragala Venkat Rahul, who had made his official debut as a senior weightlifter in the senior category (Men's 85 kg). 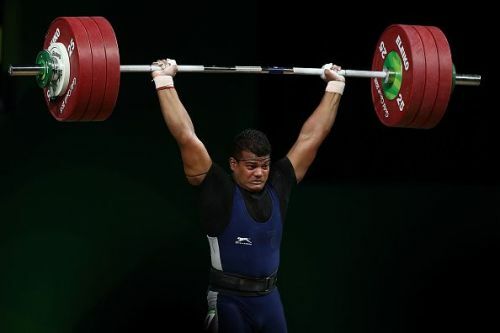 Interestingly, Ragala Rahul is also India's only weightlifter to have ever clinched a medal at the Youth Olympics, when he had to settle for silver at the Nanjing edition in 2014. Also, Ragala is a two-time bronze medalist at the IWF Youth World Championships for boys. Since then, he has improved by leaps and bounds, rising from a lowly 25th in 2015 World Championships to an impressive 9th in barely two years at the 2017 World Championships, as he switched to a higher weight category. If he continues to improve like that, Ragala could very well threaten the existing champions at Tokyo 2020. We seriously hope he does. Other promising lifters are K. Sanjita Chanu, who has broken the Games record in the Women's 53 kg, and Deepak Lather, who is the youngest Indian weightlifter to win a Commonwealth Games medal in the Men's 69 kg category. 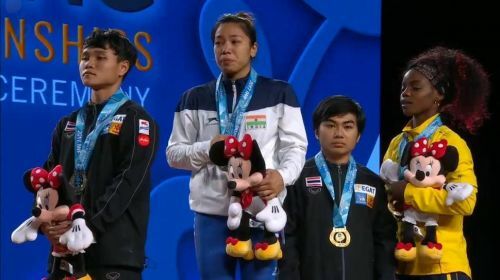 However, the one weightlifter who has proved herself as the ultimate showstopper and has shined at these Games is undoubtedly Saikhom Mirabai Chanu, the small but steely weightlifter from Women's 48 kg category. The current world champion, who had set a championship record in the route to a historic gold at the IWF World Championships in 2017, broke every Commonwealth record with every lift to clinch the gold medal at Gold Coast CWG 2018. 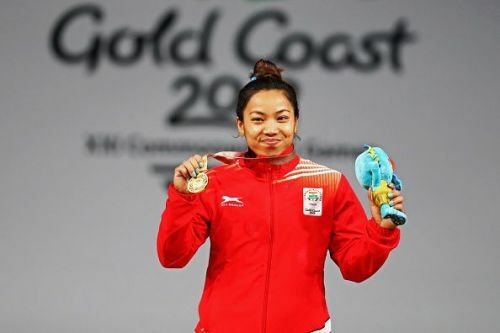 With a whopping total of 196 kgs, she was far ahead of the silver medalist from Mauritius, who could lift only 170 kg, almost 30 kilograms behind Mirabai Chanu. This humongous lift could've worked wonders at Incheon Asiad 2014 and Rio Olympics 2016, had Mirabai Chanu performed the same. The attempt of 196 kgs would've garnered a historic gold at the Asian Games 2014 and an unthinkable silver medal at Rio Olympics 2016, given that the silver medalist lifted only 192 kgs in total. This puts Mirabai as a top contender for both Jakarta Asian Games and Tokyo Olympics 2020. Who knows if Mirabai could achieve what Karnam Malleswari missed by a whisker at the Sydney Olympics, 2000? This historic performance, however, wouldn't have been possible without the support of the chief coach, Vijay Sharma, who has been chiefly responsible for the historic turnaround at these Commonwealth Games. Vijay Sharma is also the man behind Mirabai Chanu's historic performance at the World Championships last year, and could very well end the medal drought that India is suffering for years at Asian Games as well as the Olympics. Another unsung hero, who has groomed Mirabai into the lethal force that she is the ex-stalwart and triple World Championship silver medalist, Commandant N. Kunjarani Devi, who is Mirabai's personal coach. Kunjarani had narrowly missed the podium at Athens Olympics and is probably looking forward to ending that regret with a podium finish from the side of her pupil. If she does it, Kunjarani Devi will be immortalized in the history of Indian weightlifting for her achievements. The next task for the Indian team is to not cool down, but set their targets well for the upcoming Jakarta Asian Games, the Youth Olympics, as well as the World Championships. Who knows; India may create a miracle here as well?